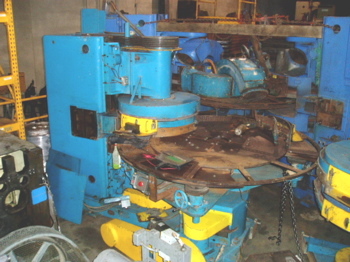 Catalog Specs: Spindle Drive Motor Max. HP - 25 Fixture Drive Motor Max. HP - 3/4 Fixture Speed Range - ToSuit Feed Wheel Maximum Dia. - 78" Abrasive Disc Max. Dia. - 36" Abrasive Thickness (Usable) - 3" Exhaust Requirements - 7000 cfm Floor Space - 126" x 176" approx. Net Weight - 22,000 lbs. approx. Spring Length - Max. - 8.0" Spring Diameter - Max. - 2.5" Wire Diameter - Max. - 3/8"